ILLUMION is a Dutch band, that presents us a beautiful mix of progressive and symphonic music with a slightly jazzy undertone. The lyrical influences come from literary inspirations, something you won't witness in this genre too often. Add to this the use of instruments, that are unlikely to be heard on many other rock albums, like the Irish flute, the Chinese two-stringed spike fiddle (erhu) and the Chinese four-stringed lute (pipa) and you'll know that this music is probably not easy to comprehend. Okay, let's check it out then. An open-mind for jazzy progressive music would be nice, if you listen to the eleven songs here. The use of exotic instruments, like in 'Chrysanthemum', is really an addition to the music. I would like to compare them to THE GATHERING in a way. They also experimented with lyrics and sound variations. ILLIUMION might be less heavy, but this is definitely enjoyable for the open-minded music fan. Another reason why I wanted to mention THE GATHERING is the voice of Esther Ladiges, who definitely shows some resemblance to Anneke van Giersbergen's. I like the uptempo 'Metamorphosis' a lot, because of the very tasteful guitarwork of Eveline van Kampen on this one. The same tasteful guitar sound can be heard in the groovy, propelling 'The Prophecy'. It gets really heavy every now and then in 'Under The Harrow'. There is variation all over in the sound of ILLUMION. I really like the sound of thunder in the song 'Whirlwind', which fits in very nicely. 'The Bliss' closes this disc with a more progressive approach. 'Hunting For Significance' has become some kind of a musical box filled with goodies of many styles. Not always heavy, but surely very innovative and good enough to explore closely. 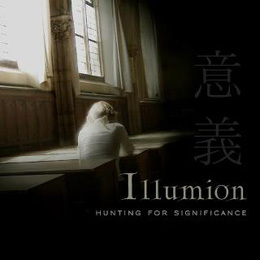 ILLUMION consists of Esther Ladiges on vocals, Eveline van Kampen on guitars and exotic Chinese instruments, Peter H. Boer on bass, Emile Boellaard on drums and Eveline Simons and Annemieke de Boer on keyboards. ILLUMION is just the band for people, who want to hear something else.